Naturally the Czars of Russia did not want the sacred soil of Mother Russia to be polluted by the footsteps of the Christ-killing Jews, so they made sure to keep the Jews out of the Empire. 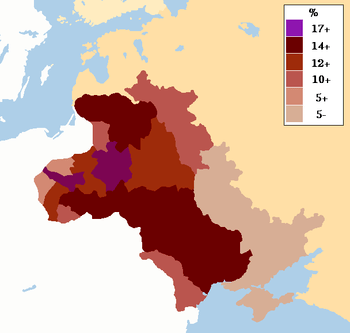 The problem was that beginning in the seventeenth and and eighteenth centuries, Russia started to expand westwards into Eastern Europe, mostly taking territories from the Polish-Lithuanian Commonwealth, which formerly ruled over much of what is now western Russia, Belorussian, and the Ukraine. These territories, especially Poland had large numbers of Jews because earlier Polish kings had encouraged them to emigrate to Poland in order to alleviate a shortage of skilled labor and merchants in the kingdom. Now, most advanced, modern nations faced with a large population of undesirables would simply exterminate them. Russia, however, was somewhat backward and primitive so the Czars decided to simply exclude the detestable Jews from Russia proper while still permitting them to live in the conquered lands. It was Catherine the Great who first created the Pale of Settlement in 1791. In 1793, Poland was partitioned among Russia, Austria, and Prussia, bringing more Jews into the Pale. Within the Pale, Jews were excluded from small agricultural settlements and villages, while their access to major cities was also limited. Most Jews lived in shtetls, Jewish communities in small towns. There were rare exceptions in which privileged Jews, mostly those with needed skills or large amounts of money were permitted to live outside the Pale, sometimes even in Moscow and Saint Petersburg. Such permission was always conditional and could be revoked at any time. The boundaries of the Pale of Settlement could also be changed without warning and without consulting the Jews. The Russian government could also change the locations where Jews could reside within the Pale, again without warning or consultation. Life in the shtetls, then was precarious and impoverished. The Jews were subject to relocations and pogroms were not uncommon. There were quotas limiting the number of Jews who could attend Russian universities. Before 1827, Jews could not serve in the Russian army but were subject to double taxation to compensate. They were forbidden to hire Christian servants and often could not own land. The Czars often encouraged the persecution of the Jews to distract attention away from their own oppressive rule. Despite the restrictions and discrimination, a rich cultural life flourished in the shtetls of the Pale. The Jews lived separately from their Gentile neighbors, speaking their own language, Yiddish, observing their own customs and largely governing themselves. The Jews formed social welfare organizations to help the more impoverished members of their community, especially students of the Yeshivas or religious schools. The Rabbis of the Pale of Settlement created new theological systems, particularly Hasidic Judaism. A literature in the Yiddish language flourished. One notable author was the humorist Sholem Aleichem, whose stories of shtetl life formed the basis for the musical Fiddler on the Roof. Towards the end of the nineteenth century, the Russian Empire was beginning to change and life in the Pale was also changing. Many young Jews were no longer content to live in a world apart. They began to speak the Russian language and adopt Russian customs. Many Jews, frustrated by the limitations of Czarist Russia emigrated to the Holy Land or to the United States. Those that remained behind tended to join radical groups such as the Bolsheviks and Jews played a prominent role in both the 1905 and 1917 revolutions. World War I was the beginning of the end of the Pale of Settlement. Many Jews fled from the Pale into Russian proper in order to escape the fighting. Under the stresses of a losing war, the Czar’s government could no longer maintain any control over its subjects and the old restrictions on the Jews were increasingly ignored. Antisemitism also increased dramatically and throughout the World War and the Russian Civil War that followed, Jews were repeatedly massacred by those who blamed them for the disorders. The Provisional Government abolished the Pale of Settlement after the abdication of Czar Nicholas II, while Poland became an independent nation once more. The Jews, and the other minorities of the Russian Empire were granted equality with the Russians. It is something of a sad irony that the end of the Czars who oppressed the Jews also meant the end of the distinctive culture of Russian Judaism. Many Jews had joined the various organizations that were devoted to ending the rule of the Czars. Jews were over represented in such radical groups as the Bolsheviks, yet the militant atheist Communist government proved to be more cruelly oppressive than the worst of the Czars. With the horrors of the Civil War, the hatred of the Communists toward any religious expression and the destruction of the Jews throughout Europe, little now remains of the formerly vibrant communities. Those Jews who remain in Russia are mostly secular and assimilated. Their numbers are shrinking rather than growing. The Yiddish language is rarely used today. Yet, a remnant of this culture remains in the Russian Jewish communities of Israel and the United States. So, the glory of the world becomes less than it was.